Cows remain in a corral at a dairy farm in San Silvestre, Barinas State, Venezuela, Nov. 28, 2018. Such carnage is common in Venezuela's cattle country, where thieves, squatters and government policy threaten a vital food resource. Venezuela's severe economic crisis is felt keenly in cities — where food sources are limited — but it's also cutting a swath through what should be the country's food basket. A view of a cowhide on the road near a ranch in San Silvestre, Barinas State, Venezuela, Nov. 28, 2018. "It's as if they were telling us: 'We are killing your cattle, so what?'" the 46-year old rancher says, fuming that complaining is useless — police and local authorities will do nothing. "I can't sleep on the farm anymore because I'm scared," said Jose Antonio Espinoza, owner of a 600-head herd in San Silvestre. "They have come around here and tied people up, and then stolen everything — chainsaws, water pumps, cattle." 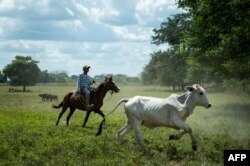 A man works at a ranch in San Silvestre, Barinas State, Venezuela, Nov. 28, 2018. Chronic shortages of protein in the cities should provide an opportunity for the country's farmers, but farms are producing less and less. Per capita meat consumption went from 20 kilos per year in 1999 to only seven kilos at present, the federation says. Even then, farmers can't fulfill demand. "We are going backwards... even though those of us who remain on the land work tooth and nail," federation president Armando Chacin told AFP. 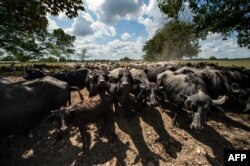 Buffalos and cows remain at a ranch in San Silvestre, Barinas State, Venezuela, Nov. 28, 2018. Now, Chavez's hand-picked successor Nicolas Maduro sets prices for basic foodstuffs, often below production costs, leading many farmers to bankruptcy. But with Venezuela's staggering inflation set to top one million percent this year — according to the International Monetary Fund -- it barely covers the cost of a truck tire. 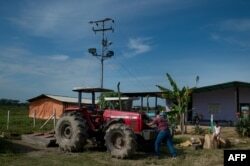 A man prepares a tractor at a farm in San Silvestre, Barinas State, Venezuela, Nov. 28, 2018. "They robbed nine tractors and three harvesters, they destroyed the house. We got tired of complaining about it and neither the national guard nor the police intervened," said Marisela Febres, the owner. 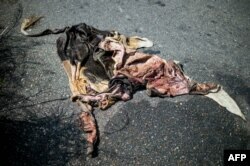 Making matters worse on a local level is that the poachers don't discriminate. A famer carries a calf at a dairy farm in San Silvestre, Barinas State, Venezuela, Nov. 28, 2018. "They killed a bull of mine with incredible genes, one that was going to be a very productive stud," he said. "If there are no medicines for people, imagine what it is like for the animals."